I have lumped these two days together because the 17th was a relatively quiet day with smaller numbers of passerines and raptors. The highlight though was an impressive movement of some 601 (counted) Glossy Ibis in several large flocks moving up the south coast. 500+ Spanish Sparrow were also notable in their large flocks. Two male Black-headed Buntings were the first for the year. One was a migrant at the point and the second was a male singing on territory. 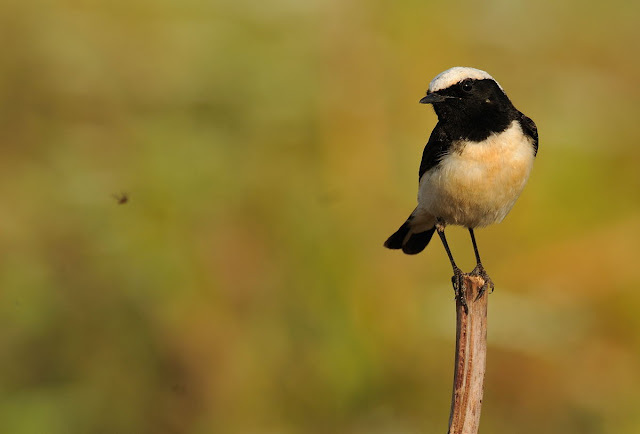 The image below is a male Cyprus Pied Wheatear. 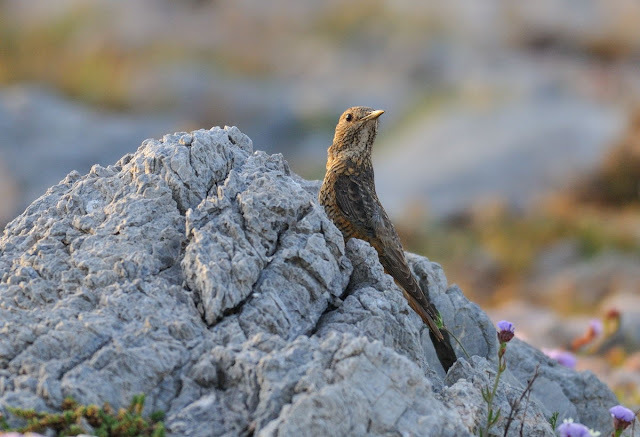 They are very common and encountered in just about every habitat on the island. That said, they are actually quite difficult to appoach but this male gave itself up in the late evening sunshine. 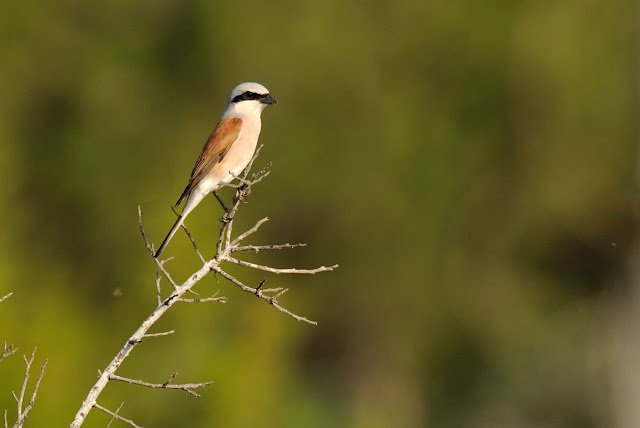 An impressive movement of shrikes occurred on the 18th April with ten Red-backed, two Masked, two Woodchat and two Lesser Grey Shrikes. The 18th improved in quality and quantity of birds. 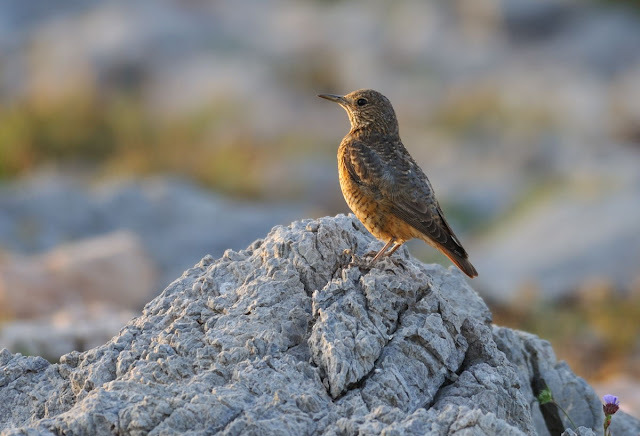 The highlight was a female Rock Thrush, found late in the evening. The images are quite dark because the sun had just about dropped. The ISO is very high and thus the resulting images are a bit grainy. It was the only Rock Thrush we saw - they are never common. Further additional highlights of the two days included: male Orphean Warbler, four male Sardinian, one Ruppell's, one Collared Flycatcher, ten Whinchat, two Golden Oriole, fem Cretzschmar's Bunting, eight Hoopoe, 20 Red-throated Pipit, six Roller, three Great Spotted Cuckoo, four Hobby, 60 Little Egret, 18 Purple Heron, two Serin, 30 Northern Wheatear, three Isabelline Wheatear and ten Black-eared Wheatear. 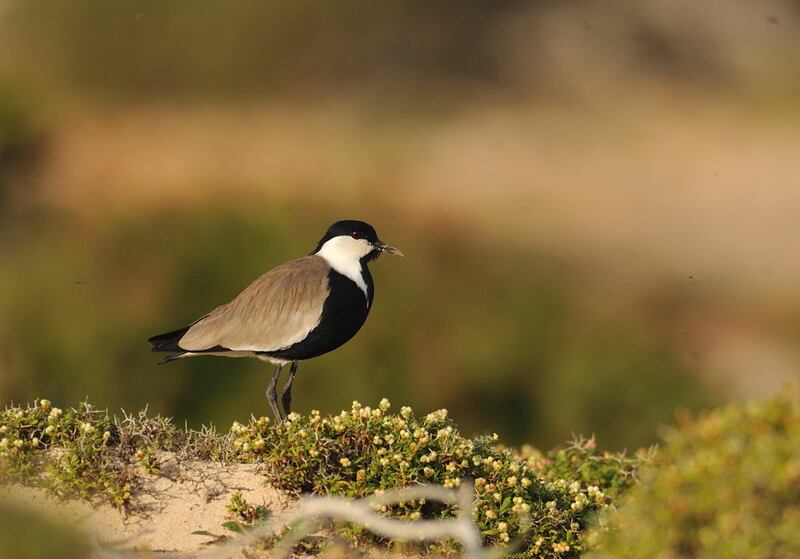 An out-of-place Spur-winged Plover was also found on the beach. Great set of shots Steve. 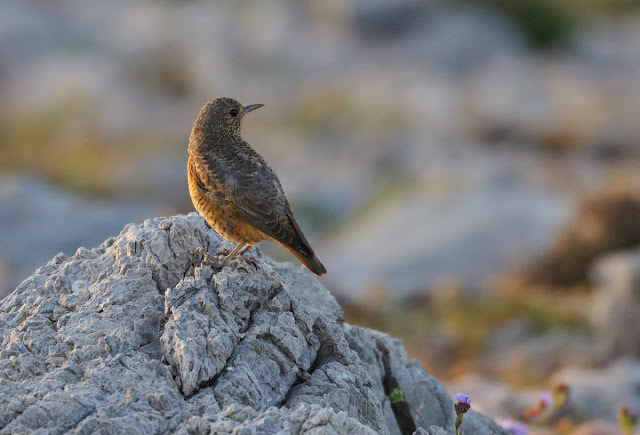 I love the Rock Thrush. I was wondering if I could use that brilliant Cyprus Wheatear photo in a seminar presentation I'm giving. I'm a PhD student working on birds in Cyprus. Thanks for the email. You are welcome to use the image for your seminar presentation. I hope it works out well for you. All I ask is that you give a credit where due. Many thanks and good luck with the presentation.